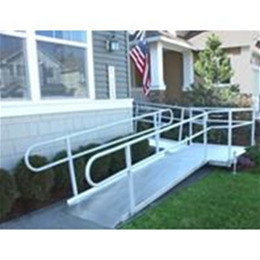 Designed to address the accessibility of the residential and light commercial market, the EZ-ACCESS® Modular Ramp system is an excellent choice when accessibility needs extend beyond the scope of a portable ramp. The efficient design uses less hardware and no pre-assembly is required. EZ-ACCESS® Modular Ramps comply with ADA guidelines and offer quick and convenient installation and removal. Made in the USA.